Well, I’ve officially been in Dresden for 2 weeks! It’s crazy how time can simultaneously fly and crawl… it seems like I’ve been here both forever and for no time at all. I’ve accomplished a lot, relatively, in the 2 weeks I’ve been here already. As far as bureaucracy goes (and you know that’s the best part of moving to Germany), I have registered as a resident of the city, matriculated as a student at the university, and bought a year-long museum pass (a new accomplishment as of today!). I realized that I hadn’t actually taken a picture with me in it to prove that I am actually in Dresden. So this is the first one! 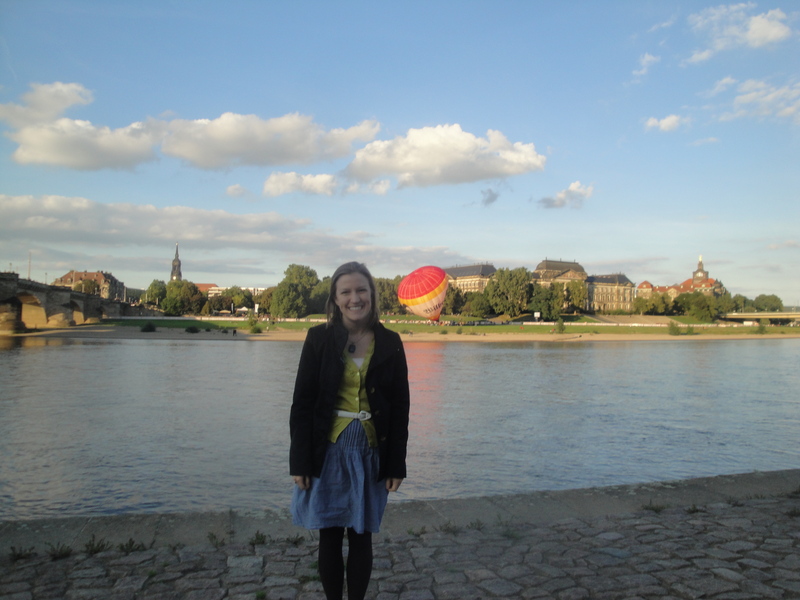 This is me, on the banks of the Elbe, watching a hot air balloon inflate! 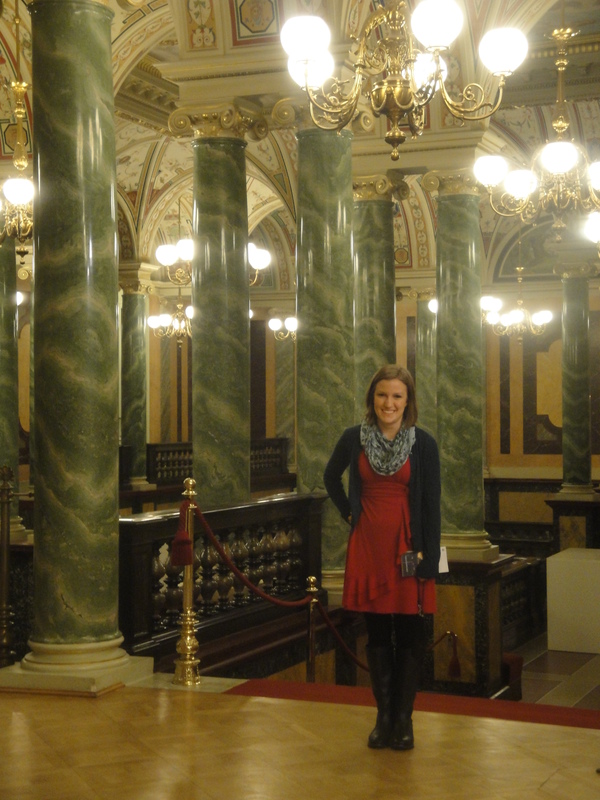 And this is me in the beautiful Semperoper! Yes, it kind of looks like I have no legs, but blame it on the black tights/black background situation. I am getting very excited about living here for the next 10 months. This is a wonderful city, and I’m so glad I’ve been placed here. I’m pumped to start meeting people, taking classes, and doing my research. I am already starting to get a feel of how to get around in Dresden via the public transport, and I have a list of things to see while I’m here. (I created a new page on the blog to keep track of everything!) I knew next to nothing about this city before I got here, and I feel up to the challenge of learning as much as possible during the next year!! However, I am kind of in a state of limbo. I haven’t had tooo much to do ever since I got myself registered and matriculated and all that. Of course, there is the thing of exploring the city, which I have done in moderate amounts. But it’s been hard thus far to force myself out to do things. The good news is that I have been able to coax myself enough to get to the free Friday exhibits at the Stadtmuseum, and to walk around the Herbstmarkt a few times, and to try out a restaurant near city hall when I was having a serious craving for Indian food. It’s one thing to be on vacation and see as many sights as possible. But it’s totally another to be in a new city where you know about 4 people total, already out of your comfort zone due to language and cultural differences, and then muster enough energy to go to 3 museums this afternoon, or whatever. This is something I already knew, but had maybe forgotten the severity of. The whirlwind is already beginning: tomorrow is Germany’s big state holiday celebrating the reunification in 1990, so I’m going hiking in the Sächsische Schweiz. Friday is foreign student orientation at the University, and then I’m leaving for a weekend in Prague!! And Tuesday, I’m going to Berlin to see my dad, who will be there speaking at a conference with Bill Clinton (both cool and hilarious). Granted, then I will still have about 10 days before classes and research starts, but things are starting to pick up!! I can feel it. Stay tuned. This is the longest I’ve ever spent in the former DDR (East Germany). I’m learning so much already, mostly through conversations with my host mom. Herr Braun is gone this week, so we’ve been able to talk one-on-one at dinner and such. 2-person conversations in a foreign language are always easier. It didn’t even occur to me until one conversation this week that most adults who live in Dresden have probably never lived in any other part of the country, because until about 20 years ago, they literally would not have been allowed to leave East Germany. In talking with Frau Braun, I have come to understand (maybe) a little more personally this concept that I’d learned about so often in school. The oppressive communist regime in East Germany, the general mistrust of your neighbors, the lack of freedom. Maybe I’d romanticized this time period while learning about it in school, or watching movies like my favorite Das Leben Der Anderen. But something tells me that living here for the next year will give me a new perspective on the former DDR and the differences between here and the US, and even between here and west Germany. She said that, in that short time in West Germany, she was so high on the feeling of freedom––of not having to be afraid that every person she interacted with was a government spy, of being able to buy things in the stores–that she could barely sleep. This is something I had definitely taken for granted. Many adults I’ll come in contact with in Dresden lived through the DDR-Zeit–maybe they were interrogated by the Stasi; maybe they were spies themselves. They definitely don’t speak English as well as their Western counterparts, because even though teaching English in school was not forbidden before 1990, there were so few English teachers in the schools that many students weren’t able to complete all the necessary language requirements to graduate. I told her about how my World Literature class watched Goodbye, Lenin! and Das Leben Der Anderen my freshman year in conjunction with a few things we read about totalitarian regimes. Her first question was whether my classmates really understood it. I responded that we’d watched the films with English subtitles, but what she had really meant to ask was whether we could actually comprehend the subject matter of the movies. We probably couldn’t, we American 18-year-olds in 2009. I’ve learned a lot about the Wiedervereinigung (German re-unification) period in school, and I’ve seen some of it “firsthand” in Berlin; the Checkpoint Charlie Museum, the Wall, etc., but it will certainly be an interesting experience to live here, in Dresden, 20 years after the fact. It’s easy to forget the oppression that happened here just before my lifetime, because to look at it, Dresden is mostly similar to other western cities (and maybe American ones, if you look hard enough). But each place has a specific history, memories of the things that have happened here and the people who have created history. It would be pretentious to say that in a year I’d be able to figure out the collective memory of the city, but the people in every place have a story to tell, and I guess I’m excited to see what impression this city will leave on me.